Union Public Service Commission (UPSC) had invited application for Assistant Command in CISF. A huge numbers of candidates had applied for these posts.The Latest News is that UPSC has released ONLINE Admit Cards for these posts available on official website of UPSC. Candidate are advised to note down the Venue of Exam and plan the route to reach the venue by Car/bus/train.It is mandatory to candidates to read all the instruction provided in the admit cards and ensure the documents required such as ID proof i.e. driving license, PAN card etc. which will require to produce at the entry level of examination. Candidate must bring at least one photocopy of ID proof to the venue of exam. Affix colour photograph of same image as provided in the printed Admit Card to the provided space. Do a cross signature on the pasted colored photograph pasted by the candidate. Remind that admit card must be signed properly below the Colored photograph paste by the candidate. The signature must be same as it is appeared in the computer generated admit card. Use of mobile phone/Calculator/Electronic gadgets is banned in exam room. 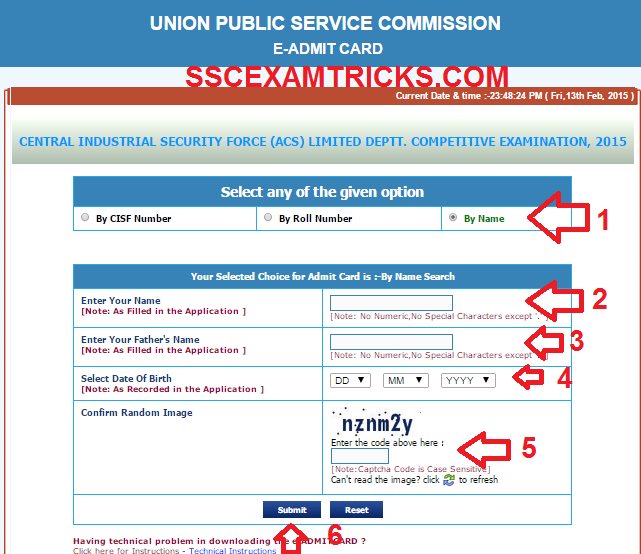 Those candidates who have applied for UPSC CISF ASSISTANT COMMANDANT Exam 2015 and are waiting for ONLINE admit cards can download their Call Letter/Admit Card from the direct link provided below. - Read the instruction provided on the screen and click on the 'YES' button provided at the bottom of the page. - Three options will be provided on the screen to download Admit cards. First will be search by CISF Number, Second by Roll Number and third by Name of the candidate. Choose the option say Name of the candidate. - Enter Name of the candidate, Father Name, Date of birth and Image code which will be appear on the screen. · Click on submit button and download the admit card in PDF. · Save or Print the Admit Card for exam requirements. It is advised to the candidate that in Physical Test, a candidate must bring three copies of recent coloured passport size photographs without glasses. Don’t forget to bring your admit card at venue of Physical Test. No candidates will be allowed to attend PT without Call Letters/Admit cards of PT. No candidates will be allowed to participate in PT wearing underwear. No uniform is required for PT. Medical standard -The candidate must not have knock knee, flat foot, varicose vein or squint in eyes and they should possess high colour vision. Candidate must be in good mental and bodily health and free from any physical defect likely to interfere with the efficient performance of the duties. Eye sight - The minimum distant vision should be 6/6 and 6/9 of two eyes without correction i.e. without wearing of glasses.